One of developmental biology’s most perplexing questions concerns what signals transform masses of undifferentiated cells into tremendously complex organisms, a process called ontogeny. programming by the nuclear FGFR1 protein. New research by University at Buffalo scientists, published last week in PLOS ONE, provides evidence that it all begins with a single “master” growth factor receptor that regulates the entire genome. “The finding provides a new level of understanding of the fundamental aspects of how organisms develop,” says senior author Michal K. Stachowiak, PhD, professor in the Department of Pathology and Anatomical Sciences in the UB School of Medicine and Biomedical Sciences and senior author. He also directs the Stem Cell Engraftment and In Vivo Analysis Facility and the Stem Cell Culture and Training Facility at the Western New York Stem Cell Culture and Analysis Center at UB. “Our research shows how a single growth factor receptor protein moves directly to the nucleus in order to program the entire genome,” he said. of Pathology and Anatomical Sciences. The research challenges a long-held supposition in biology that specific types of growth factors only functioned at a cell’s surface. For two decades, Stachowiak’s team has been intrigued by the possibility that growth factors function from within the nucleus, a point, he says, this current paper finally proves. A more advanced understanding of how organisms form, based on this work, has the potential to significantly enhance the understanding and treatment of cancers, which result from uncontrolled development as well as congenital diseases, the researchers say. The new research also will contribute to the understanding of how stem cells work. This work was conducted on mouse embryonic stem cells, not human cells. “Now we think we have discovered what may be the most important player, which organizes this cacophony of genes into a symphony of biological development with logical pathways and circuits,” he said. At the centre of the discovery is a single protein called nuclear Fibroblast Growth Factor Receptor 1 (nFGFR1). “FGFR1 occupies a position at the top of the gene hierarchy that directs the development of multicellular animals,” said Stachowiak. The FGFR1 gene is known to govern gastrulation, occurring in early development, where the three-layered embryonic structure forms. It also plays a major role in the development of the central and peripheral nervous systems and the development of the body’s major systems, including muscles and bones. 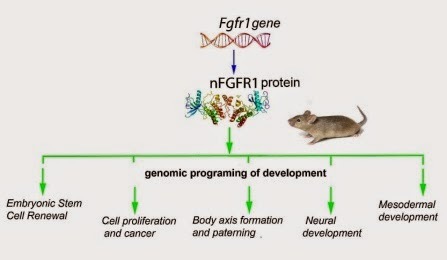 To study how nuclear FGFR1 worked, the UB team used genome-wide sequencing of mouse embryonic stem cells programmed to develop cells of the nervous system, with additional experiments in which nuclear FGFR1 was either introduced or blocked. The researchers found that the protein was responsible, either alone or with so-called partner nuclear receptors, for ensuring that embryonic stem cells develop into differentiated cells. By targeting thousands of genes, it controls the development of the major points of growth in the body (known as axes) as well as neuronal and muscle development. The research shows that nuclear FGFR1 binds to promoters of genes that encode transcription factors, the proteins that control which genes are turned on or off in the genome. “We found that this protein works as a kind of ‘orchestration factor,’ preferably targeting certain gene promoters and enhancers. The idea that a single protein could bind thousands of genes and then organize them into a hierarchy, that was unknown,” Stachowiak said. The discovery that a single protein can exert such a global genomic function stems from recent advances in DNA sequencing technologies, which allow for the sequencing of a complex genome in just hours. “NextGen DNA sequencing allows us to analyse millions of DNA sequences selected by the interacting protein,” Stachowiak said. In the UB research, the DNA sequencing data were processed by the supercomputer at the university’s Center for Computational Research (CCR). Stachowiak and his colleagues then spent weeks aligning these data to the genome and conducting further analyses. “We imposed nuclear FGFR1 on every little corner of genome,” he said. They found that the protein binds to genes that make neurons and muscles as well as to an important oncogene, TP63, which is involved in a number of common cancers. Other studies in Stachowiak’s laboratory demonstrate that these interactions also take place in the human genome, controlling function and possibly underlying diseases like schizophrenia. Targeting of the nuclear FGFR1 allows for the reactivation of neural development in the adult brain in preclinical studies and thus, Stachowiak says, may offer unprecedented opportunity for regenerative medicine. Nuclear accumulation of nuclear FGFR1 may be altered in some cancer cells, and thus could become a focus in cancer therapy, he added. “This seminal discovery lends new perspectives to the origin, nature and treatment of a variety of human disease,” Stachowiak concluded.